Assisted Suicide and Euthanasia – What Is Legal? Euthanasia is the painless killing of a patient who is suffering from an incurable and painful disease, or who is in an irreversible coma (sometimes referred to as "mercy killing"). The practice is illegal in most countries, and certainly illegal in the UK. There are a number of similar terms, that mean slightly different things. The term comes from an ancient Greek phrase meaning "good death". Assisted suicide is the act of deliberately helping another person to kill themselves. For example, if a doctor gave a patient strong sedatives knowing that the patient had the intent to abuse the medication to kill themselves, then the doctor would be engaging in assisted suicide. Are there different types of Euthanasia? Yes, two widely used terms are "active euthanasia" and "passive euthanasia". Active euthanasia is when somebody acts to end another person's life; for example, by administering a lethal dose of a drug. Passive euthanasia is when treatment is withdrawn to end somebody's life. This can be confused with withdrawing treatment when it is in a person's best interests. Passive euthanasia is not legal, but withdrawing life-sustaining treatment because it's in the person's best interests can be part of good palliative care and is not euthanasia. There are two other classifications of euthanasia: voluntary and non-voluntary euthanasia. Voluntary euthanasia is when a person makes a conscious decision to die and asks for help to do so. Non-voluntary euthanasia is when a person is unable to give their consent for treatment (for example, because they're in a coma) and another person makes the decision on their behalf, often because the ill person previously expressed a wish for their life to be ended in such circumstances. In the UK, is Euthanasia or Assisted Suicide ever legal? Assisted suicide and euthanasia are both illegal in the UK. Suicide is not illegal, but assisting somebody to commit suicide is illegal and has a penalty of up to 14 years in prison. 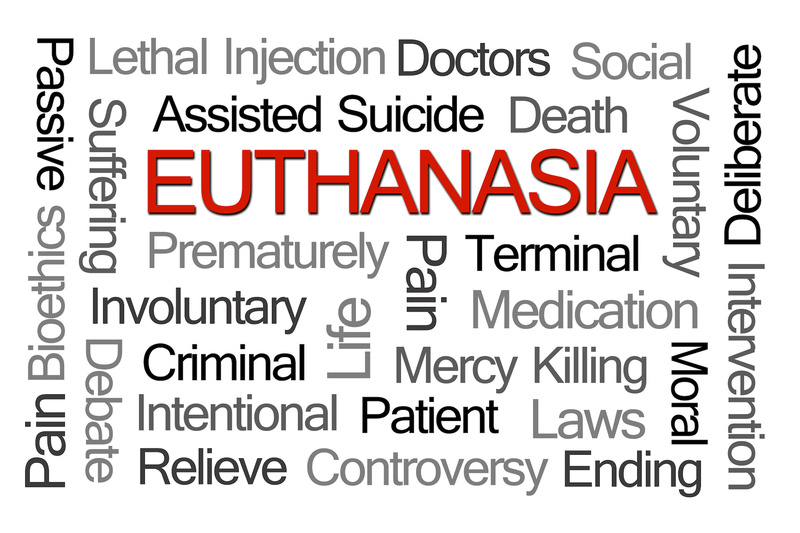 Euthanasia is considered manslaughter with a maximum penalty of life in prison. There are many pressure groups including Dignity in Dying campaigning to make assisted suicide legal in specific situations. Is Assisted Suicide legal anywhere? As of March 2018, human euthanasia is legal in the Netherlands, Belgium, Colombia, Luxembourg, Canada and India. Assisted suicide is legal in Switzerland, Germany, South Korea, Japan, and in the US states of Washington, Oregon, Colorado, Hawaii, Vermont, Montana, Washington DC, and California. An assisted dying scheme in the Australian state of Victoria comes into effect in mid-2019. What can I include in my Advance Directives? An Advance Directive, or "Advance Decision" is also sometimes referred to as an advance decision to refuse treatment (ADRT). It is a decision that you make whilst you are mentally capable in advance of losing that capacity. The decision typically includes the type of medical treatment that you wish to receive. Within an Advance Decision you can refuse a treatment that could potentially keep you alive, known as life-sustaining treatment. Are my Advance Directives legally binding? Yes. As long as your Advance Decision and your Advance Statement are in writing and signed, then they must be respected and honoured by the attending medical team.